When suffering from hair loss, it is important to know which category you fall under. That can help you diagnose the problem better and ultimately take right steps to solve it. The right treatment begins with the right diagnosis. Know what the types of hair loss are, so you can identify your condition and treat it properly. Hair loss, also called Alopecia, is a condition where a person loses hair and start becoming bald as the condition progresses. A natural condition that comes with old age. The majority of hair goes into a resting phase. The remaining hairs also recede by decreasing in number and size. A genetic condition that occurs in both men and women. Male Pattern Baldness refers hair loss condition in men. It occurs during teens or early 20s. The hairline begins to recede gradually disappears from the frontal scalp crown. Women experiencing this genetic condition have a different pattern. The hair starts thinning all over the scalp after the age of 40. The hair loss is more extensive on the crown. This is a partial baldness condition that results in patchy hair loss among children and young adults. It starts suddenly. In 90% of people, the hair returns in a few years. 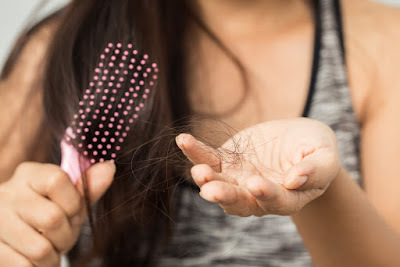 This is a temporary condition that doesn't lead to permanent hair loss (for most people), but a temporary lack of growth that reverses over time. This is a more severe condition that leads to hair loss from not just the scalp but all over the body. People suffering from Alopecia Universalis lose hair from the eyebrows, eyelashes, and even pubic area. This is more of a psychological condition seen mostly among children. There’s no problem with the hair or scalp. But the loss is due to physically pulling one’s own hair. A condition of hair thinning over the scalp that’s caused due to disturbances in the hair growth cycle. A majority of hairs go into a resting phase and hair starts shedding and thinning. This is a condition that causes permanent hair loss. Due to external or internal damage, follicles can get permanently damaged and hair wouldn’t grow anymore. Examples of such damages can be inflammation of the scalp due to cellulitis, folliculitis, acne, or other disorders like lupus and lichen planus. Sometimes even harsh styling treatments can also cause permanent damage. Diagnose your hair loss type with the Kaya Targeted Root Regen System and get safe and effective treatment from expert dermatologists. Know more about their services and their happy customers from Kaya Skin Clinic Reviews.